2getheraudio is a new music software brand for musicians, composers, DJs, game developers and home studio enthusiasts. What makes 2getheraudio pretty unique is that its products are extremely accessible, by offering customers to pay what they can afford while half of that purchase price goes to a social cause of their choice. Wait, I know what you’re thinking – cheap stuff = amateur quality. Not in this case. The company might be new, but its engineers are certainly not the new kids on the block, having licensed their solutions for professional synthesizers, audio effects, DSP, and other audio technologies (read more below). The first two plugins from 2getheraudio, available now, are RE4ORM, a Free4orm Additive Synthesizer virtual instrument, and RE4ORM FX, an Audio Shape Remixer effects plugin. Both plugins bring an exciting new way to create sounds by drawing or warping waveform shapes with your mouse, an intuitive and easy approach with amazing sonic results. 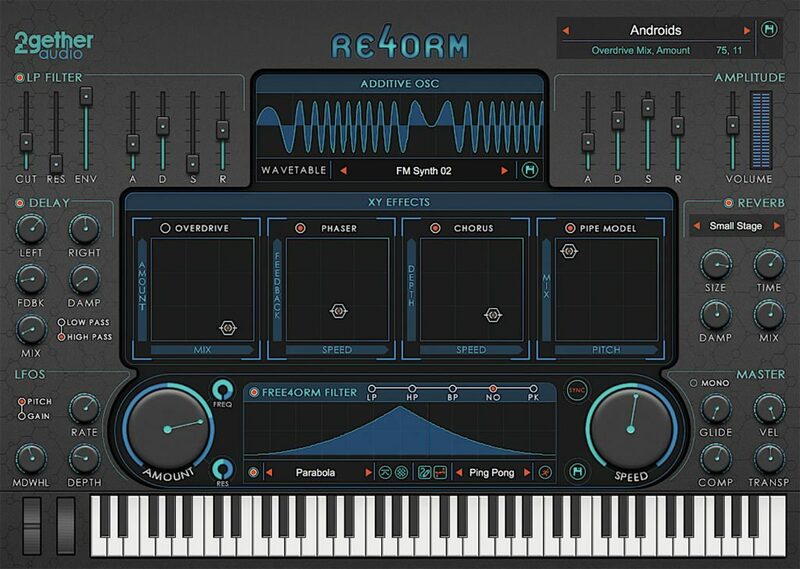 In RE4ORM, users can draw and warp the shape of both the additive synth waveform and a multi-filter modulation LFO called the Free4orm Filter. In RE4ORM FX, users have access to eight Free4orm LFOs for modulating 20 different included audio effects. The Free4orm LFO is a much more creative way to add automation to your plugins. Even better, the factory included Free4orm shapes such as Fractals, Skyline, Crystals and Pulses are all synchronized to the DAW tempo with user selectable speeds leading to experimentation and sonic results you just can’t get any other way. Of course, users can create and save their own Free4orm shapes leading to endless possibilities for custom sound design. RE4ORM and RE4ORM FX utilize the Qubiq Audio struQture™ audio engine, a software platform that builds virtual instruments and effects plugins and features a fully modular architecture for combining multiple synthesis methods (sample playback, virtual analog, FM, additive and others), modulators, effects and players like arpeggiators. The struQture audio engine is used in plugins from Akai Professional, NOS Audio, Sonivox and others and is built and maintained by 2getheraudio engineers.